Novel audio effects that exploit Semantic Web technologies and content analysis at the point of content creation. This demonstrator takes advantage of Music Information Retrieval (MIR) techniques to control Digital Audio Effects in musically meaningful terms. 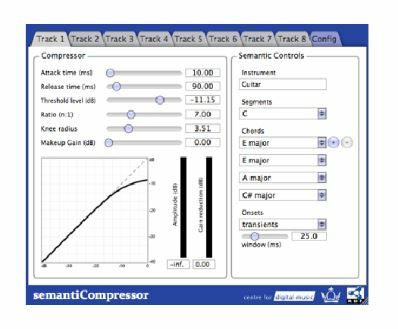 It addresses the problem of programming and automating effect parameters and allows an audio engineer to associate parameter sets with audio characteristics and musically defined passages. The audio effect is controlled by audio features extracted from individual tracks. It is capable of processing multiple audio tracks in parallel, thus enabling the implementation of cross-adaptive functionalities. Wilmering, T. and Fazekas, G. and Sandler, M., High level semantic metadata for the control of multitrack adaptive audio effects, in: Proc. of the 133rd Convention of the Audio Engineering Society, San Francisco, California, 2012.